Through observation I am aware that foods that I crave and keep thinking about are the very foods that keep me in immersed in an addictive cycle. What definitely helps is to observe one’s patterns and behaviours and not only in that moment but the after effect that follows. So in other words keeping an ever and lovingly observing eye on ourselves. Our bodies are so clever, they are so alert with what foods we put in them. If we stop to listen to how the body feels after, we will know exactly what it did or did not like. What are stimulants like coffee doing that make us think we are more relaxed for consuming them? That is an interesting question and my feeling is that it is not a true relaxing but rather a comparative relaxing from the tension of needing a coffee or what ever the substance is. The coffee or whatever is a drug that is calling us to partake again in its stimulation so we get relieved when we have one. Maybe? “The banana sandwich” – it’s interesting how we can eat something at one time, for instance like bananas [which I used to enjoy as a child] and then later on or a few years on find the digestion of [bananas] no longer suiting; in my case I noted I bloated with the sugar. When we listen to our bodies, our diet is easy.. it only becomes complex when we involve a wanton mind that overrides our bodily communication. It’s an interesting question as to why we eat foods that we know don’t suit us or have a negative effect on our bodies – I work amongst these amazing cakes and brownies that I a hundred percent know my body doesn’t like but still I often try it out (and regret it). I think for me it’s a deliberate choice to negate my own responsibility in life by testing what I can and cannot get away with, rather than accepting and embracing the fact my body cannot eat these foods and feel ok after. Is it a deliberate choice because there is a need? If it is a need, then what is the need? If that needs is there, why is that need there? Eventually we will come down to a choice and it may be as simple as choosing to move in the house or at work in a less than full expression of how awesome we are. Whenever I see something I know tastes good and my taste buds would enjoy the consuming I then tune in how my body would feel afterwards ( by past experiences ) By that, I can easily choose between 5 seconds of satisfaction in my mouth followed by heaviness or raciness or a clear, light, still body. It’s interesting that we may have a moment that we crave something, and we know what it does to our body. We may even be aware of the source of our craving. So, why do we buy the large loaf and a big bunch of bananas, or a large of whatever our craving choose, that will guilt us into eating more. Could it be like when you were little, and you were accused of something you did not do, and there was no way of changing the accuser’s stance, it permitted you to do whatever you had been accused of? Although the body needs food to stay healthy and alive, food also has a dulling affect at the time of eating and digesting in which we are less aware. We all know that moment when we would love to take a nap after a meal. Although this is a physical reaction of the body it too affects us in our awareness and discernment on what is in front of us. Therefore it is wise to eat light as it keeps the body and awareness light and ready to serve when needed – which could be any time. We don’t value awareness, which is strange as it is vitally important to our health and wellbeing. I have experienced that overeating can calm me down at the moment of eating but later on it makes my body anxious and racy as it is too occupied with digesting all the different foods at the same time. I can relate to what you share, overeating can be a form or numbing so we don’t have to take responsibility. Yes true and the awful effect of the food lasts hours and hours, sometimes day compared to that of the ten second delicious taste in the mouth. It is such a great thing to do to observe our behaviours around food, I sort of go into this very mild, subtle but there frenzy as my spirit takes control and I over eat or intake sugar in some form or other. Take last night for instance we had a guest and we ordered a curry, I was famished as I hadn’t eaten since breakfast and ate far more than I should have which resulted in a night of heartburn which proved that it was so not worth the over indulgence. It is good to take a stop moment to feel what is truly going on, even after eating nuts which tend to make me feel dull, if I can stop to feel, I can still feel something. Not as much as I would if I hadn’t eaten anything but enough to remind me that my body feels all the time and to encourage myself to want to feel more. So true when we stop after eating our bodies confirm to us how it is feeling, where nourished, full of vitality or sluggish and tired. All of these are great reflection. This is so relatable Carmel, because I have never been overweight I used to kid myself that I did not have an eating problem yet many years ago I stopped buying biscuits because I knew that if I opened the packet I would just keep going back to them until they were all gone. As others have shared, for me it is my behaviour around certain foods that exposes the addictive quality and how I am using food to dull myself and it is too late to try and be ‘disciplined’ when I am in the shopping aisle but rather it is about what led me to that moment and how willing I am to be open to the awareness that I am trying to avoid. Yep I need to take a closer look to my eating patterns. Not only observe that I eat to ease tension, and be honest about that, but then to back track why there was tension in the first place. A pure example that there is more at play than just our hunger-filled cravings driving us to open the pantry. Clearly there is another creature at work within us that does not work in harmony with the body. Super important to be honest about this and even more important to make this every day conversation. When we will be honest in this conversations, the assortment of the supermarkets will drastically change because we will no longer choose for the foods that do not support us in staying light and aware. We all know how great we all feel when we choose to make food choices that support us. As always each choice offers us comfort or the potential to live the vitality we often talk about. ‘ there was a definite addictive quality to the way I was eating it’, I recognise this Carmel, and every time I eat like this, I already know, this food product has to go…My pattern is, I normally continue eating a little while longer, and then all of a sudden, its like ok enough of this food, you are now purely indulging, and I stop buying and eating it! Just recently I started eating again a food product that I had stopped eating, which was humous. I ate I think 2 tubs with celery sticks as a morning snack till lunchtime. I found I could have continued eating many more tubs, but didn’t because I could feel the effects on my body, I didn’t feel so clear, and felt a little tired. It then became a really simple choice, no more humous, my body does not need it. It is the Yes to the clarity that lets you stop eating it and not a brain construct or idea, why you should not eat it. A beautiful example of choosing out of a greater purpose to not eat something, by experiencing the effect in you own body, instead of blindly following diet rules. Its amazing how much of how we approach eating could in actual fact be considered a disorder – when we reach for food because we feel tension, an emotion, boredom etc and the food provides a temporary relief. As well as the consciousness, the way we approach food also makes a difference. It also opens up the conversation to consider if we are using food for any other reason than to nourish then it is being used like a medicine or drug to temporarily relieve. First we had popcorn at the movies, then T.V. snakes, and now snacking and drinking in the car when we consider how much food dulls us, is it becoming obvious to eat at regular times and share in uplifting conversation and then the food may not matter as much? And when we look at historical photos we were very much a healthier society and the main thing was a shared meal every evening with uplifting discussion. If we take a moment to look back in time – how often would you see a person walking, eating and talk on the phone. And now we don’t blink an eye lid at this behaviour. Create the abnormal and it becomes the normal. I find it quite extraordinary how much I can think about preparing, or eating food some days. As you say Carmel, I can have hardly finished one meal before I am looking forward to the next. It is great to notice this pre-occupation and why sometimes it is there, and other times it isn’t. I do know when I am doing something I am bored with, or don’t particularly want to be doing, the food thoughts creep in quite often as a distraction. This is an interesting one. I was thinking of you waiting to go and eat the banana sandwich – and how will power isn’t the fix. It’s a bandaid over a broken arm, if you will. It doesn’t address the reason behind that urge. And also, in many ways it’s better to just smash down that sandwich than to will yourself not to do it. I really love your honesty though, it’s very relatable and refreshing. I clicked on the hyperlink for ‘snack’ in this blog and it was interesting to read that 60 years ago snacking did not exist but now it has become or we have made it part of our culture to snack, eating on the go (even walking down the street!) 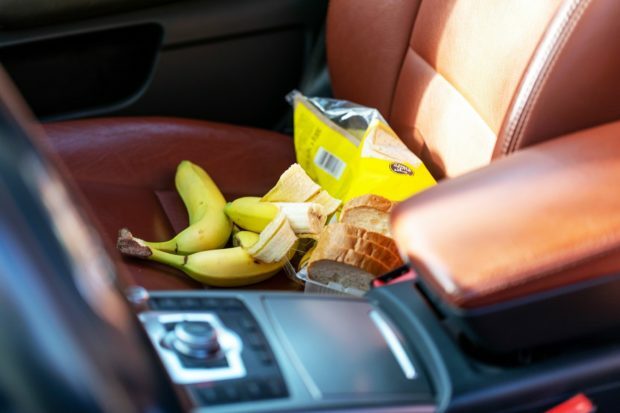 eating in our cars while driving, eating at our desk when it is not break time. So surely the question has to be asked at this time where we have the opportunity in the world to feel more than ever what is going on … what it is that we don’t want to feel? With this it is not just feelings of overwhelm or angst we don’t want to feel so we go to food from personal experience and from hearing others experiences we eat to also not feel how amazing we are/feel!!!! Crazy isn’t it. And something that I feel we definitely need to explore and discuss more. It is interesting how our culture has shifted. Before the advent of much TV (I am old enough to remember having only 2 channels and the trade transmission test cards), how it was the norm for all families to sit at the table together in the evening to share their evening meal, to not encourage the eating between meals and so on. In my earlier years, there were no such things as takeaways – apart from fish and chips, which my family was never into. With the advent of easy and quick food, round the clock TV and mobile phones, we have made it so much easier for ourselves to check out, withdraw, not connect to ourselves in full or to those we live with. Well worth asking the question why we have allowed this to become the norm. Agreed Joshua, at least we are then able to understand what is leading to behaviours we may not want to continue doing. When we have the awareness we can start to make different choices. The comfort of food and my awareness and not wanting to feel what I do come hand in hand and it is something I am working with also. A brilliant honest sharing of the way we can learn more about ourselves from listening to our body and its messages and our whole evolution and contentment in life. All my life I have been a binger, I never ate chocolates because if I started I would eat the whole box and when I drank alcohol or smoked cigarettes it was always to excess, so now it is just food and I certainly do like my food, I often nibble when cooking so when it is all done I probably have had enough but I eat it anyway because it is there. It is a good thing to know why we eat and why we crave certain things and know that it is all about dulling otherwise I would be twice the size probably. Food is the instant and easy solution to not feel any tension of awareness and responsibility anymore. The moment we say Yes to that, food does not have such a grip on us anymore. I allow myself to stop before I put more food than necessary in my mouth and feel what is the truth behind my tend to overeat. The moment I do announce that clearly and give space for that, what energies are at play, I can let go of the snacking after a big meal. Tried it out yesterday and it worked. Food consumption is such an important factor when it comes to our sense of focus, our well-being, and clarity … though how often is it that we have it the other way round i.e place the focus on our well-being, focus and clarity first as our priority and importance to then determine what foods to consume. What you write Carmel reflects the disease and obsessions of people who live in affluent and western countries: an obsession with food because we have too much of it and most people live with excess. For the large majority of the world’s population it’s the opposite. Their main preoccupaton is growing, picking and finding food to eat that one meal in a day, if at all. For richer countries food is easily come by, all they have to do is choose which food to buy off the shelf or online. As you say, in poorer countries, their whole life is geared towards making enough food to feed the family every day. It does not feel balanced that there are these two extremes. Dulling or awareness? One requires effort the other just flows. How much energy do we spend on doing nothing? One day we will prove and fully realise that it’s not the end results that truly effect us but the quality of energy we let govern us and the way we move that actually hurts. Beautiful words of wisdom Joseph, thank you. I recently realise this too. Isn’t it crazy that when you have something where you can feel the addictive quality kick in it’s insane how you just don’t stop thinking about it on a regular basis. This was huge for me when I stopped smoking three times! An insightful view on humanity. It is one of our core issues. I love how down to earth and practical you are Carmel. With obesity figures on the rise and ill health statistics off the chart, this is the type of conversations we need to be having. Using food to medicate ourselves has never worked and is no different to any kind of drug we become addicted to. So true Julie this is a pressing issue for so many and unless we are willing to be honest about what has led us to this point the inevitable downward spiral into illness and disease will continue and intensify. I know that when I am feeling pretty sensitive to things, then food is an easy out to dull myself. The more I feel any inner turmoil or tension, the more I turn to food and think I need it. When in fact – the higher the level of love in my body, the less likely I am to fill it with food, therefore food is not the issue – it is how much love am I willing to feel and express. Beautifully said and I can very much relate to what you say and how if we focus just on food itself we can miss the bigger picture of what our relationship with food is reflecting to us. I have found this to be true with my own body too HM. When holding awareness with my body, the craving for food just disappears. “When in fact – the higher the level of love in my body, the less likely I am to fill it with food, therefore food is not the issue – it is how much love am I willing to feel and express”. A brilliant presentation Carmel of how we medicate ourselves with food, as such we use foods much like a drug to escape what we are truly feeling and clocking, relive our tension and the drain of emotions we take on. Even over eating all the ‘right’ foods has the same effect. The more we explore the quality and purpose of why and how we are eating the more, if we are willing, will choose to eat in honor of our evolution and maximise living our true potential. This is a continual work in progress for me and the more I am open to being honest with what is going on the more fascinating I find it all. Food like all things can either maximise or minimise our potential. Before I met Serge Benhayon and came across the Ageless Wisdom teachings, it simply would not have consciously occurred to me that I abused my body through the foods I chose to eat, even though on an unarticulated level I knew what I was doing but it was so normalised that it simply wasn’t a consideration. To understand that I am still abusing my body when I overeat the ‘right’ foods (which at the moment is pretty much every day) is supporting in my awareness of the tensions I am carrying and why they are there. The moment I overeat I cut myself off the communication of the space that is all around me. It then only counts me, what I want, instead of feeding my vehicle in a way, that accesses the greater intelligence that is all around us all the time. Simply waiting to get accessed while we are making the ME- dance over and over again on this plane of life. Letting my body be the driver instead my thoughts and ‘desires’ has revolutionised my relationship with food. And even when I ‘blow it’ and feel the consequences, it is a great learning experience. I can relate Jenny and I love observing how my body feels after eating certain foods and being open to learning. When we are open to learn then there cannot be a hint of judgement, and this means we can have so much fun with observing and listening to our body. When feeling low, I find that once I give into a craving I just want more of it and I can’t say no. When I feel good in myself, especially when feeling joyful I find it’s easy to say no, as in the moment I clock how the food will affect my body and that it will dull my feeling of joy… and let’s face it when feeling joyful no amount of sugar, banana or chocolate can ever be a real substitute. Useful to know a craving reflects an inner void or need. Giving in to it only brings temporary relief, going deeper and exploring what’s at play and why leads to more lasting solutions. It is far better to be understanding and observant of your behaviours than judgement and self bashing which is far far worse than the fullness of any incorrect foods could ever bring. I agree Joshua, a loving understanding and observation of our food choices will allow us to feel the momentum we were in which led to our choices, whereas if we engage in self judgement we lose an opportunity to deepen our understanding of ourselves and our living way. Self judgement is borne out of the same energy as is eating to numb. Same same but different.